Funerals started on Friday, with some of the bodies identified through DNA samples. Guatemala City: Guatemala's minister for social welfare, Carlos Rodas, offered his resignation after a blaze in a government-run children's shelter killed 40 teenage girls. In his letter to President Jimmy Morales yesterday, Rodas said he was handing in his notice in order to "contribute to the objective investigation into the tragedy." He said he had not resigned earlier because he first needed to oversee the counseling and medical treatment of survivors at the shelter, and their transfer to other refuges. The fire that broke out last Wednesday in the badly overcrowded Virgin of the Assumption Safe Home for children just to the east of Guatemala City killed 19 girls right away. The other deaths came as girls taken to hospitals succumbed over subsequent days to horrific burns that had also damaged their throats and lungs. All the victims were aged between 14 and 17. Funerals started on Friday, with some of the bodies identified through DNA samples. Another seven girls were in critical condition. Five of them were flown to a hospital in the United States for specialised treatment. An investigation is seeking to determine the cause and circumstances of the fire. Initial information suggested the girls might have started the blaze themselves, setting alight mattresses to protest cruel treatment by staff in the facility, including sexual abuse. 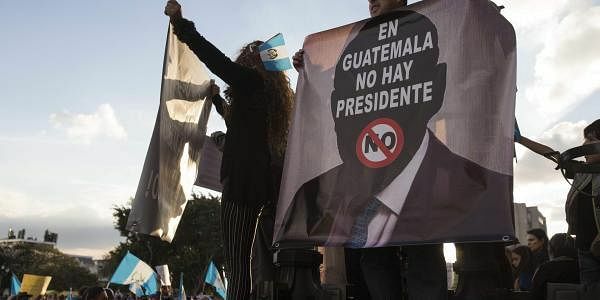 Hundreds of demonstrators on Saturday rallied in front of Morales' presidential palace, accusing authorities of negligence and demanding punishment. Morales yesterday said he had requested that the FBI and international organisations help in the investigation, to make the process transparent.